Acquisitions | Field Boots, Slips, Cap and Case! Traditionally, the annual Pier Antiques Show has seemed like a real life stroll through 1stDibs.com - i.e. a fantastic experience for that 1% crew. If you stuck next to the Hermes and Chanel selections, nothing had changed, but we scoured the joint and scored some great 1%-worthy-lookin' stuff for, let's say, 72nd percentile prices. Highlights included these custom-made-for-someone-else (and barely-worn) E. Vogel field boots and a perfect little schoolboy cap. Then there were the loads of last minute purchases needed to finish the (honestly almost complete) design project: a flag, a 19th century monkey in a frame, a deco lamp, a sterling and glass bourbon decanter, a horse-jumping photo tryptic, six architectural sketches and an old squash racket. 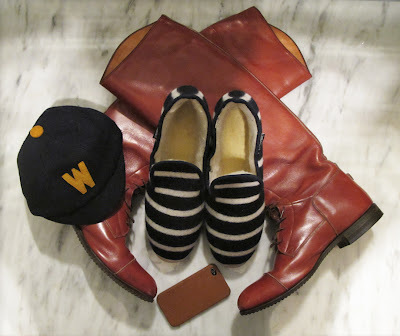 On top of all that, I meandered through SoHo and Nolita where I found a great leather iPhone case at the J.Crew men's shop and the warmest, cutest wintery espadrille-esque house slippers from the new Armor Lux shop on Mulberry Street. The latter helped me realize the true greatest failing of corporate America today: only 0.00001% of workers actually get to wear wool house slippers at the office. I think I need a tent. The slippers are amazing, but so much more in conjunction with those boots!! Love at first sight!! Those boots! The boots were only $65! We almost fell on the floor. Many thanks to the eagle eye that spotted those puppies. awesome new acquisitions. i adore your taste in things. I wish I lived somewhere in the East...you find the best stuff! Love the boots and wool slippers. I can hardly wait for the release of your book! Vogel boots...I can't even begin to express my jealousy. Enjoy them to the utmost!